the over-the-head style headset which is made for office worker, SOHO, or call center staff. Coupled with noise cancellation technology and wideband audio, it delivers clearer conversation and offer a more professional customer experience on every call. 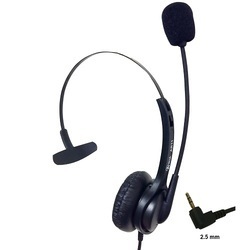 The Luminous Headset Monaural is the premier choice of call centers in which the environment may have more noise and users require the elimination of background disturbance and the enhancement of a caller's voice. The LH-3001M is backed by a No Questions Asked, abuse or accident, one-year warranty. The low mass, Noise-cancelling Microphone, mounted on the flexible boom arm, is an electret type. 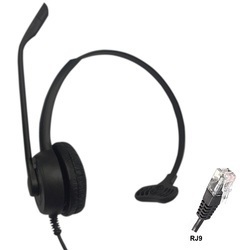 The T10 Single-Line Headset Telephone is a stand-alone headset system that includes the Plantronics convertible headset, and standard features such as redial, flash and mute. The T10 Headset Telephone features a headset rather than a traditional telephone handset, making it ideal for telephone-intensive SOHO applications. The T10 Headset Telephone connects to a standard telephone jack. The HME 46-3S is a very lightweight single-sided and comfortable open boomset. It is ideal for air traffic control. The headset is equipped with ActiveGard©, which protects controllers from the effects of an acoustic burst.